In this chapter, we raise the question of what makes the Swiss case worth presenting to an international audience. 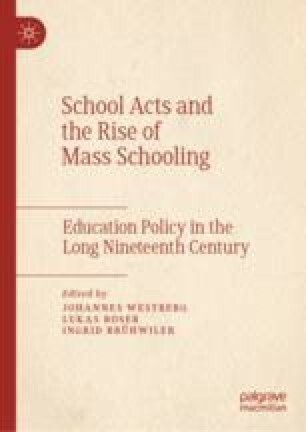 We argue that Switzerland is an interesting case because Swiss formal education lacks much of the structural systematization a system of mass schooling is expected to have. A close examination of the formal schooling in Switzerland reveals that every canton is given the autonomy to organize primary and most of secondary education. School structures and school legislation are mainly cantonal affairs, not guided by centralized agency or national body of law. However, given that similarities undoubtedly exist between those cantonal school systems, it is important to examine how those similarities came into being, as it is likely that the cantons are not as independent in their decision-making as it might appear at a first glance. Gebauer, S. Absenzen Primarschule Kanton Zürich (Repetirschule, Ergänzungsschule). Last modified November 6, 2015, accessed February 19, 2018, http://www.bildungsgeschichte.uzh.ch/static/prod/bg_files/biz_ZH_T2_A5a.xls. Gebauer, S. Absenzen Primarschule Kanton Appenzell-Ausserrhoden (Bildungsgang). Accessed February 19, 2018, http://www.bildungsgeschichte.uzh.ch/static/prod/bg_files/biz_AR_T2_A5.xls. Gebauer, S. Lernende Primarschule Kanton Zürich (Repetirschule, Ergänzungsschule) (Geschlecht, Bildungsgang). Last modified November 6, 2015, accessed February 19, 2018, http://www.bildungsgeschichte.uzh.ch/static/prod/bg_files/biz_ZH_T2_A2b.xls. Ruoss, Thomas. Absenzen Primarschule Kanton Solothurn. Accessed February 19, 2018, http://www.bildungsgeschichte.uzh.ch/static/prod/bg_files/biz_SO_T2_A5.xls.